And we interrupt the broadcast of the Andaman Travelogues to write a post about something very close to my heart! About a year back, almost to the day, a certain blogger sat in her Mumbai home moodily twisting her curly hair between her fingers. Always given to whacky ideas and new initiatives, she wanted to start something different. As she sat there drumming her fingers on her laptop, an idea brewed in her head - An idea that would eventually have such far reaching impact that even she would be amazed. She decided to start a group called Indiblogeshwaries - A group of Indian women bloggers. And since she has to do everything differently she decided to forbid sharing of blog links on this page. “No self-promotion” she proclaimed. “We will talk of everything and anything on this page except our blogs !” She started off by inviting her blog friends to join this group and they liked it so much there that they in turn decided to invite their friends! I was initiated into this secret society by Purba Ray. When a blogger of Purba’s caliber asks you to do something. You don’t demur. You just do it. So I joined! For the first few weeks I hardly visited the group. I didn't know too many people there and I felt shy participating. So I used to sort of hover on the sidelines, simply reading the comments and then going away without saying my two bits. But then slowly the conversations there started intriguing me. So very slowly, very hesitatingly I started participating. Initially I was wary of expressing my opinion in a group where I hardly knew anyone. But then once I started commenting; I was warmly welcomed, taken by hand and pulled in till I felt I was in the middle of a mad boisterous never ending party. Suddenly from being a stranger who hovered hesitatingly at the doorstep I was now cozily sitting on the sofa with a drink in my hand, vouchsafing my opinion and getting into discussions about everything and anything under the sun. I am from JNU, and have lived and breathed the concept of Adda- Baazi there. And this group is Adda Baazi at its best – Virtual Addabazi if you may say so, but as stimulating and as refreshing as actually talking face to face. The comradeship I have discovered here is unbelievable. We are a varied group – From Dentists to homemakers to motivational speakers to environment specialists. We come from different backgrounds and may have nothing in common, but the way I have seen blogeshwaries support and rally around each other is simply fantastic! We rejoice in the happiness of others and feel their sadness as if it was our own! This is a group that will make you laugh with its witty one liners and whacky sense of humor. This is also a group where you will hear stories of indomitable courage and quiet resilience and wisdom and be awed. This is a group that will help and support you unabashedly. Will pick you up tenderly when you are down and then at the same time, unceremoniously brush the dust off you and tell you to stop whining and get on with life woman! And ohh there are fireworks and how! We are opinionated, we clash and we don’t bow down easily. Histrionics and double standards are rarely tolerated and we bare our claws with dry sarcasm or sugar coated politeness that will cut you to the quick! But we enjoy the fireworks as much as we enjoy everything else. The bottom line is we are never judgmental and we are quick to forget and move on! Yesterday, on June 2 this wonderful group turned One. And so on this momentous occasion I would like to raise a toast to Vinita who had the mad mad idea to start this group and also to our very able Administrators Janaki and Corinne. Also, a big thank you to Garima who took the initiative and worked very hard to give us our header ! And last but not the least a toast to all of us blogeshwaries. The Header with all of us - created by Garima ! Here’s to us ladies! May the madness continue! And since Vinita doesn't let us off easily, On the occasion of this group turning one, she wanted us to do that One Elusive thing that we are scared of or have been putting off doing. Honestly speaking I didn't really take up the challenge after Vinita had posted about it. 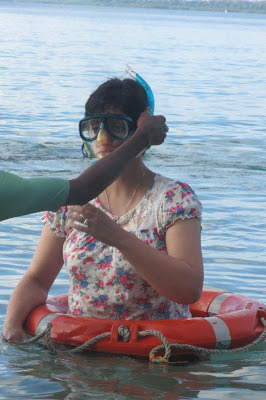 But a few days before Vinita came up with this challenge, I was in Andaman and there I attempted something I never thought I would in my wildest dreams. You see I am scared of being under water, and so haven’t been to the sea so far. I firmly believe that If God had wanted me to swim, he would have given me fins! I like my face to be out of water and I like to have my feet firmly on the ground! Although I have been long intrigued with marine life and the wonderful world that lies beneath the sea, my fear has always prevented me from exploring it. 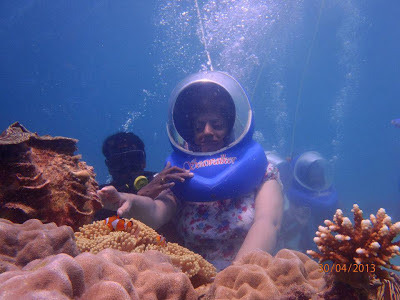 I had the opportunity to get under water in Havelock Island and discover that world for myself. And this time I thought I would be damned if I let my fear come in my way! So I gathered my courage and literally jumped in! I not only snorkeled but also did an underwater sea walk for 45 minutes. And it was so worth it because I got a chance to see a magical world - a colorful, utterly beautiful and mesmerizing world! And to prove that I actually did it – Here are a few pics ! It is lovely isnt it ! The underwater walk was amazing ! That is spectacular Ruchira! What an ElusiveOne to tame! Loved the post. The way you've described the group had me nodding nineteen to a dozen! Thank you :P Thsi is exactly how I feel about the group ! No there isnt I suppose :P Underwater was such an amazing experience. Thank you ! I am so glad I met you through this group Sridevi ! What a beautiful introduction to the madness and warmth that is IndiBlogeshwariLand. May our tribe prosper. As for your own Elusive One, going underwater is something that has intrigued and frightened me too. Congratulations on pushing the fear away and getting on with life. Yes, May the tribe prosper indeed ! Getting my fear out of the way and going under water feels like a big achievement to me ! ROFL ! Thank you for this lovely group. I am honored to be a part of it. Lovely lovely post. Come to think of it, I didn't know anyone eithet. And then a harmless thread that I started about stubble seriously went wild. That was the first time I really soaked in that wicked girlie fun, From then it has been a riot -- mostly fun. So glad to have met you here. And wow that took courage. I am scared of going underwater as well. Oh Rachna, you were infamous for setting us on fire and then running away.............SIGH! what a convo that was! hehe Indiblogeshwaris. I had no such intentions but I do have to taje off from FB to do work no matter how much I wanted to stick around :). By the time I came back so much exciting stuff has already hapoened. Sorry for all the typos. The tab does it. It truly is wonderful, the camaraderie we feel :). My...I don't think I can ever do that. Good for you. Wonderful Post. Wow ! learning to swim at 40 is something ! Wow, that's my dream, snorkeling. Pl. do a detailed picture post. And love the word Adda Baazi! Ruch - shameless request - can I get an invite to the group? I badly need it at this point....coz I hardly get any time for real life connections and feel such a bad need to converse. Let me know. I've done undersea walking and snorkeling so I can relate to your experience - surreal :). Glad you went for it. I want to do diving next...let's see when :). Undersea walking was indeed surreal. It was amazing ! Believe me - once you let go of your fear - Its a marvelous experience. Those snorkelling pics r defntly inspiring and the bliss on ur face is clear ! Thank you ! Bliss on having overcome my fear and on seeing a totally magical world ! Ohh Ritu I was so hesitant. Initially till I am comfortable. I tend to be very shy ! Wow! You did it!! Underwater sea walk, snorkeling despite apprehensions... awesome! I love water and swimming and so looking forward to this adventure. Fantastic, Ruchira. Finally caught up with all your pictures and posts that I had missed! My brother was in the Andamans for a couple of months, and came back with similar stunning pictures. So fascinated by the skies there...almost a reflection of the lovely water! And I'm so glad that you decided to do the sea walk and the snorkeling - must have been a real experience, once you overcame your fears! Wow, Ruchira, you went underwater and walked for 45 minutes!! Amazing! Must have been quite a magical experience. I have always wanted to try snorkeling or some kind of underwater sport, but the fear of water always got the better of me each time I even thought of giving a try! Kudos to you for shedding your fear! Wow Ruchira - that is truly challenging. I am so afraid of the water but I hope I will snorkel someday. A superbly written post. I loved every bit of this post and everything is just to true. Seriously this group rocks and I am glad to be a part of it. Even though I don't participate much. It's like I am still in the phase where you initially were. I once posted there to seek advice on a very personal and intricate matter... but o! god! The way all of you ladies came forward for me!! i was and still am touched by it.